Jesus covenanted to fulfill the Father’s plan by atoning for the sins of the world. At [the] Council in the heavens the plan that should be adopted in relation to the sons of God who were then spirits, and had not yet obtained tabernacles, was duly considered. For, in view of the creation of the world and the placing of men upon it, whereby it would be possible for them to obtain tabernacles, and in those tabernacles obey laws of life, and with them again be exalted among the Gods, we are told, that at that time, “the morning stars sang together, and all the sons of God shouted for joy.” [Job 38:7.] The question then arose, how, and upon what principle, should the salvation, exaltation and eternal glory of God’s sons be brought about? From these remarks made by the well beloved Son, we should naturally infer that in the discussion of this subject the Father had made known His will and developed His plan and design pertaining to these matters, and all that His well beloved Son wanted to do was to carry out the will of His Father, as it would appear had been before expressed. He also wished the glory to be given to His Father, who, as God the Father, and the originator and designer of the plan, had a right to all the honor and glory. We need the Atonement in order to overcome the effects of the Fall. To carry out the Atonement, Jesus Christ took upon Himself our sins and suffered death in the flesh. We are told that “without shedding of blood is no remission” of sins [Hebrews 9:22]. This is beyond our comprehension. Jesus had to take away sin by the sacrifice of Himself, the just for the unjust. … As He in His own person bore the sins of all, and atoned for them by the sacrifice of Himself, so there came upon Him the weight and agony of ages and generations, the indescribable agony consequent upon this great sacrificial atonement wherein He bore the sins of the world, and suffered in His own person the consequences of an eternal law of God broken by man. Hence His profound grief, His indescribable anguish, His overpowering torture, all experienced in the submission to … the requirements of an inexorable law. The plan, the arrangement, the agreement, the covenant was made, entered into and accepted before the foundation of the world; it was prefigured by sacrifices, and was carried out and consummated on the cross. Hence being the mediator between God and man, He becomes by right the dictator and director on earth and in heaven for the living and for the dead, for the past, the present and the future, pertaining to man as associated with this earth or the heavens, in time or eternity, the Captain of our salvation, the Apostle and High-Priest of our profession, the Lord and Giver of life. 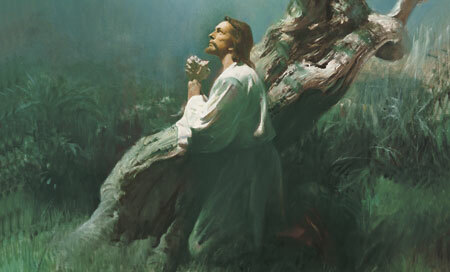 Jesus Christ was the only one who could carry out the Atonement. It may here be asked, What difference is there between the Son of God, as the Son of God, the Redeemer, and those who believe in Him and partake of the blessings of the Gospel? One thing, as we read, is that the Father gave Him power to have life in Himself: “For as the Father hath life in himself; so hath he given to the Son to have life in himself;” [John 5:26] and further, He had power, when all mankind had lost their life, to restore life to them again; and hence He is the Resurrection and the Life, which power no other man possesses. Another distinction is, that having this life in Himself, He had power, as He said, to lay down His life and to take it up again, which power was also given Him by the Father. This is also a power which no other being associated with this earth possesses. Again, He is the brightness of His Father’s glory and the express image of His person. Also, He doeth what He seeth the Father do, while we only do that which we are permitted and empowered to do by Him. He is the Elect, the Chosen, and one of the Presidency in the heavens, and in Him dwells all the fulness of the Godhead bodily, which could not be said of us in any of these particulars. Another thing is, that all power is given to Him in heaven and upon earth, which no earthly being could say. It is also stated that Lucifer was before Adam; so was Jesus. And Adam, as well as all other believers, was commanded to do all that he did in the name of the Son, and to call upon God in His name for ever more; which honor was not applicable to any earthly being. When we learned of Heavenly Father’s plan—with Jesus as our Savior—“the morning stars sang together, and all the sons of God shouted for joy” (Job 38:7). Why do you think we felt so joyful? What can we learn from the Savior’s response to Heavenly Father’s will in the Grand Council in Heaven? Because of the Fall of Adam and Eve, all people are subject to physical death and to spiritual death, or separation from God. What did the Savior do to overcome the effects of the Fall? Why was Jesus Christ the only one who could carry out the Atonement? How do you feel when you ponder the Savior’s atoning sacrifice? How can knowledge of the Atonement offer hope and reassurance as we live each day? The Mediation and Atonement (1882), 133. Deseret News (Weekly), 15 Jan. 1873, 760. The Mediation and Atonement, 93–94; paragraphing altered. The Mediation and Atonement, 97. The Mediation and Atonement, 96–97. The Mediation and Atonement, 128–29; paragraphing altered. The Gospel Kingdom, sel. G. Homer Durham (1943), 118. The Mediation and Atonement, 149–51. The Mediation and Atonement, 171–72. The Mediation and Atonement, 135–38.